When the First World War broke out in 1914, southern Albertans eagerly enlisted. The Calgary Exhibition continued to run. Manager Ernie Richardson was extremely patriotic, and the Exhibitions helped garner support for the war effort while showcasing the importance of western agricultural production to the war. The 1915 Exhibition became known as the “Khaki Fair” because it featured military tattoos and parades as well as demonstrations of military exercises. The 1919 Exhibition celebrated both the end of the First World War and the economic success of wartime Alberta, which had supplied agricultural products for the war effort. Manager Ernie Richardson hired Pilots Fred McCall and "Wop" May to perform aerial tricks. McCall opened the Exhibition by landing his plane on the infield with his passenger, Brigadier General H.F. McDonald. On July 5, McCall took Exhibition Manager Ernie Richardson's two sons on an aerial tour of Victoria Park, when his plane stalled. Faced with the choice between crash-landing in the Infield, where events were taking place, or on top of a merry-go-round, McCall chose the merry-go-round. Amazingly, no one was injured in the landing. Calgary Flying Ace Fed McCall shot down 37 German planes during the First World War. McCall joined the 175th Battalion of the Canadian Expeditionary Force in 1916, but transferred into the Royal Flying Corps in 1917. Flying a slow two-seater plane, he shot down his first enemy aircraft only a month after reaching the front. When McCall came back to Canada after the war, he and Wilfrid “Wop” May leased two U.S. Army plans and began stunt flying at fairs, including the 1919 Calgary Exhibition. McCall went on to establish a number of other civil aviation ventures and fought again in the Second World War. An entrepreneur and life-long adventure seeker, McCall was memorialized in 1959 when the Calgary municipal airport was named in his honour. He died in January, 1949. Edmonton native Wilfrid “Wop” May was a First World War Flying Ace with 13 recorded kills. In April 1918 he narrowly escaped being the last recorded kill by the notorious “Red Baron,” Baron von Richthofen. While in a dog fight with the Red Baron, May drew him towards ground forces who managed to take him down. After the war, May took up stunt flying with Fred McCall, including at the 1919 Calgary Exhibition. He was the first person to deliver air mail above the Arctic Circle. In 1929, he transported medicine to treat a diphtheria outbreak in Fort Vermillion. He died in 1952 on a hike in Utah at the age of 57, and is remembered in a song by Stomping Tom Connors. NASA has named a rock on Mars after him. In early 1919, the manager of the Calgary Exhibition, Ernie Richardson, decided that the city needed a one-off extravaganza to celebrate the end of the First World War. He met with the Big Four, and proposed that they hold another Stampede. Weadick was brought back to Calgary to organize it. Just like in 1912, the 1919 Victory Stampede brought the world's best cowboys to Calgary to compete for prize money and prestige. Unfortunately, the September event came at the peak of wartime inflation and a poor crop yield. Weadick did everything we could to spur turnout, including convincing the city to make one afternoon a civic holiday so people could attend the rodeo. Despite his best efforts, the Stampede only broke even, and there were no profits left to distribute to the Great War Veterans' Association, the Salvation Army and the YMCA, who were supposed to be the event's beneficiaries. The Stampede was not held again between 1920 and 1923. An economic downturn hit Calgary in the 1920s, and the Exhibition was losing money. They had invested in significant additions to Stampede Park in 1919, including a new, fireproof, Grandstand. However, postwar labour troubles and the high cost of building materials meant that improving the grounds was much more expensive than anticipated. These costs were compounded by a failed crop that fall. By 1920, Western Canada was in recession. To save the Exhibition, Ernie Richardson looked to offer better entertainment by incorporating the Stampede in it, so he hired Guy Weadick as an arena manager. With Weadick’s encouragement, the entire city participated in celebrating the event. Merchants decorated their storefronts, everyone was encouraged to dress western and there was a daily 2-hour parade downtown featuring First Nations in full regalia. There was also a cowboys and old timers street dance (which, by 1928, took up an entire city block). Weadick also decided that he needed to come up a new and exciting event to mark the first year that the Stampede and Calgary Exhibition were joining forces in a single event. He came up with the chuckwagon races, which were inspired by his time on the range watching wagons compete to be the first unit to set up camp at each new stop along the trail. The first Stampede breakfast was held in 1923, and became an annual tradition. Seen here, pancake breakfast in downtown Calgary, 1924. Cowboys and city dwellers enjoying pancakes in downtown Calgary, 1924. 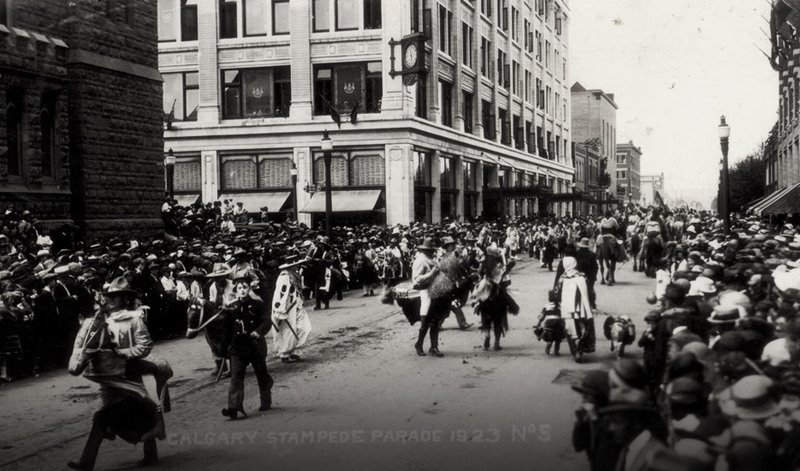 The 1923 Stampede Parade was a well-attended event. 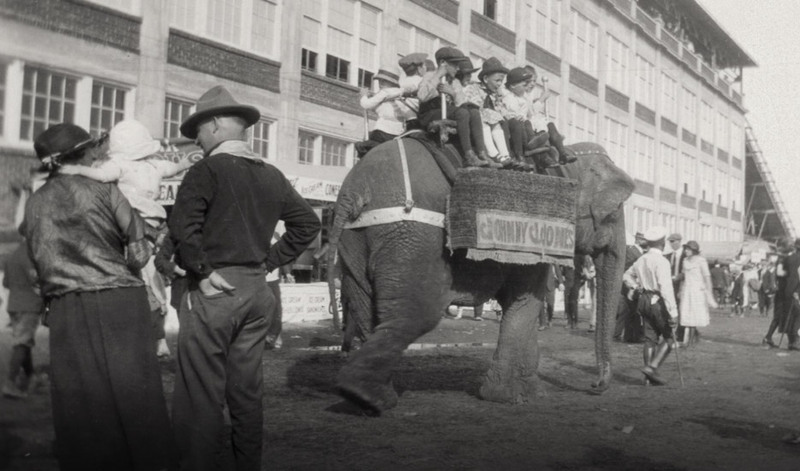 Elephant rides were a popular entertainment in 1923. The Grandstand can be seen in the background. Trying to attract more visitors to Victoria Park exhibition grounds, Ernie Richardson put on a winter carnival in 1921 and 1922. The Grandstand ski jump was supposed to be the highlight, but Calgary's wild winter weather limited its use. 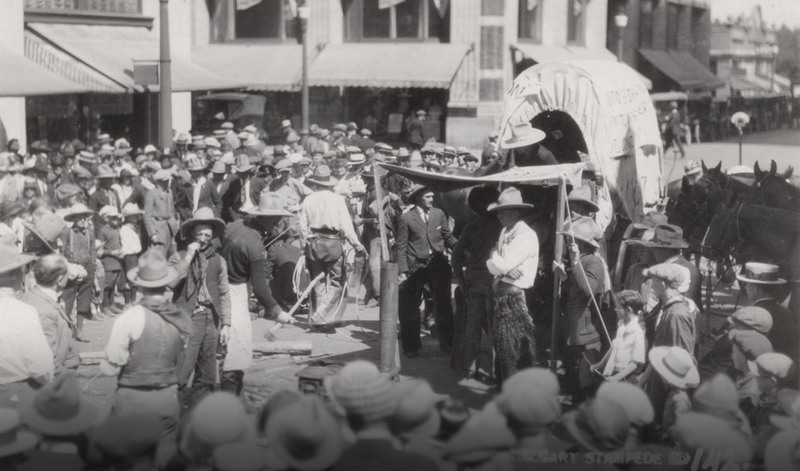 With chuckwagon races, the first pancake breakfasts and downtown businesses decorating their storefronts, the Stampede as we know it today was born. The very first chuckwagon competition at the Calgary Stampede occurred in 1923. 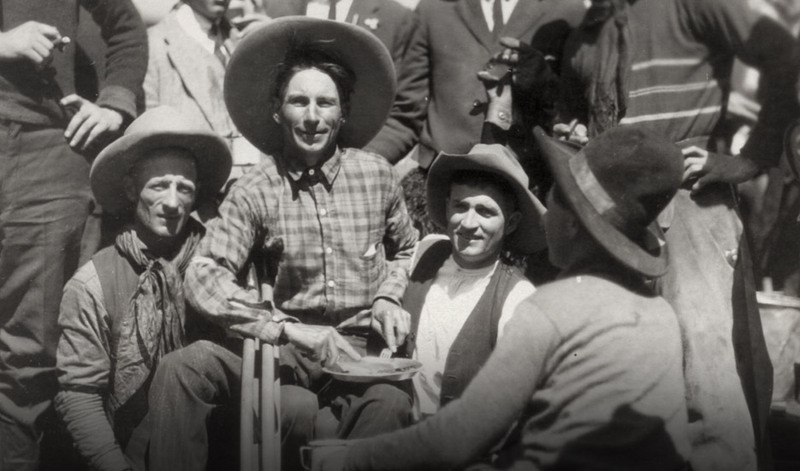 Stampede founder Guy Weadick recruited ranchers to enter their chuckwagon and roundup crews in competition, and the Rangeland Derby was born. Billed as the No. 10 Event evening competition, the "Cowboy's Chuck-Wagon Race" offered purses and prizes totaling $275. An outfit consisted of four horses, a wagon, a driver and four helpers. The Yukon's Bill Sommers won the first race. For the Official Canadian Championship, each outfit was required to "Cut a figure eight around barrels, out through backstretch into track, run around track back to camp ground, unhook team from wagon, stretch fly. No less than two stakes, and make fire. First smoke decides winner." First place Day Money was $25, with $15 and $10 for second and third. The entrant winning the greatest number of races out of five was awarded a special prize: a $25 John B. Stetson hat. Over the years the sport and the format evolved. In 1975 entry became limited to the top 32 outfits from the Canadian Professional Rodeo Association. In subsequent years various independents and rodeo associations were invited to compete. Currently the Stampede invites the top 16 drivers and outfits from the previous year's GMC Rangeland Derby back, joining a selection of drivers from the two professional circuits. The Stampede truly became a community gathering space during this time. 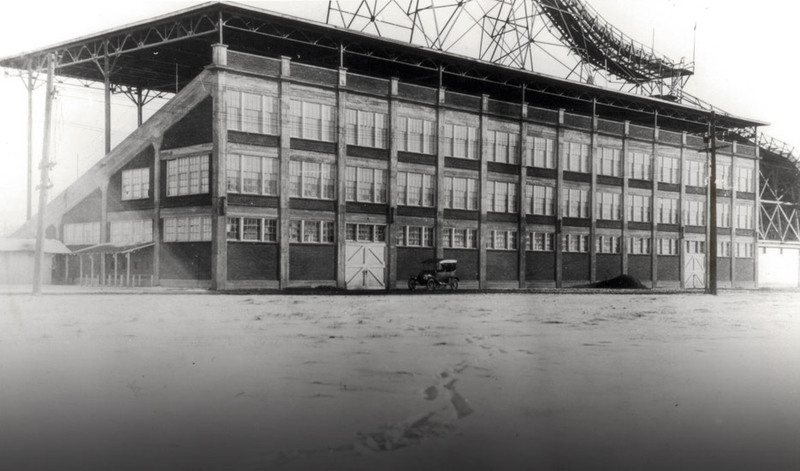 The Grandstand became the site of industrial shop courses for the Provincial Institute of Technology and Art (now SAIT), training men who would go on to contribute to the nation’s essential war industries. Military members served as parade marshals each year, and the event served as a welcome distraction for 10 days each July. After the defeat of Nazi Germany and Imperial Japan, the Stampede once again became a site of celebration for western Canada’s military contributions to victory.